The final televised adventures of the U.S.S. Enterprise arriving on Blu-ray in December have been fully detailed. 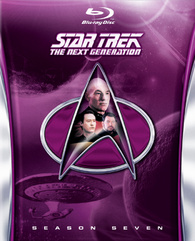 As previously reported, Paramount will be bringing 'Star Trek: The Next Generation - Season 7' to Blu-ray on December 2. The 2-part finale 'All Good Things' will also be available on the same date. The crew of the Starship Enterprise makes its final remarkable voyages with these classic episodes, which were retransferred from original film into stunning high-definition. Each Blu-ray also includes a new collection of special features that dives into the Star Trek® universe like never before. STAR TREK: THE NEXT GENERATION – SEASON SEVEN BLU-RAY includes all 25 episodes of the final season and a trove of never-before-seen interviews with cast and crew, including the three-part documentary “The Sky’s The Limit: The Eclipse Of Star Trek: The Next Generation” and “In Conversation: Lensing Star Trek: The Next Generation.” Along with an unreleased gag reel and exclusive deleted scenes, the seventh season collection features some of the most acclaimed episodes of the series such as the conclusion to the two-part episode “Descent;” Worf’s (Michael Dorn) conflict with his human foster brother who violates the prime directive to save a doomed primitive race in “Homeward;” the two-part episode “Gambit;” Data meeting a woman who claims to be his mother in “Inheritance;” and the stunning, final confrontation between Picard and Q (John de Lancie) in the series finale “All Good Things…”. Plus, the thrilling final season also features can’t-miss guest appearances from Kirsten Dunst, Terry O’Quinn, and former L.A. Laker James Worthy. 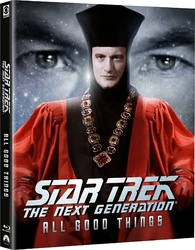 STAR TREK: THE NEXT GENERATION – ALL GOOD THINGS BLU-RAY presents the epic feature-length series finale remastered into high-definition. The 1995 Hugo Award winner for “Best Dramatic Presentation,” the thrilling adventure was also hailed as a “picture-perfect” (USA Today) ending to the series. 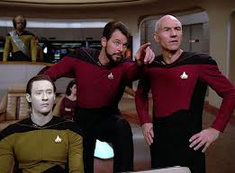 A journey that takes fans to the end of the universe and beyond the boundaries of time itself, “All Good Things…” begins when Q tells Captain Picard that he is to be the cause of humanity’s ultimate annihilation. Thus begins an incredible journey through space and time that follows Picard’s first voyage on the Enterprise to 25 years into the future. Fans can revisit the engrossing finale with the newly produced documentary “The Unknown Possibilities of Existence: Making ‘All Good Things…’” and never-before-released deleted scenes. Suggested list price for the season set is $129.99 while 'All Good Things' is $29.99. You can find the latest specs for 'Star Trek: The Next Generation - Season 7' and 'Star Trek: The Next Generation - All Good Things' linked from our Blu-ray Release Schedule, where they're indexed under December 2.